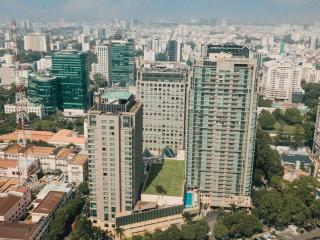 Centrally located in Ho Chi Minh City's business, shopping and entertainment district, Caravelle Saigon offers 4.5 star accommodation in an historic building that has added a modern influence to the remaining classic French and Vietnamese architecture. This award-winning hotel enjoys a great range of onsite facilities and is close to a range of popular attractions including Vincom Centre Shopping Mall, the Opera House and Ho Chi Minh City Hall Square. 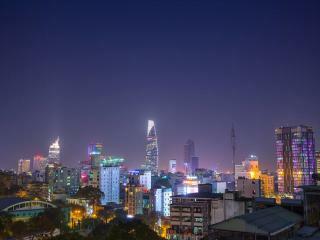 Ho Chi Minh City is a city in southern Vietnam that has history, culture, nightlife and shopping. 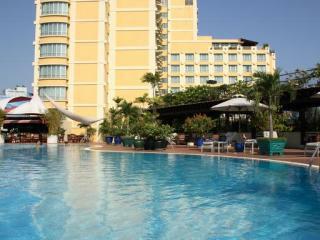 You can enjoy all of this when you stay at Fusion Suites Saigon. This all suite property offers guests spacious suites, a restaurant and Cafe, spa and fitness centre – all located right in the heart of Ho Chi Minh City. Popular tourist attractions such as the War Remnants Museum and Independence Palace are all close by, as is the Tan Son Nhat International Airport. 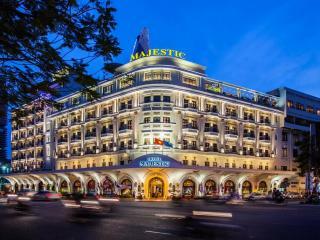 Located in Central Ho Chi Minh City, Hotel Majestic Saigon is strategically situated in the heart of Saigon's shopping, dining and entertainment district. One of few Vietnamese hotels to be 100% smoke-free, this historic hotel offers 4 star accommodation with a great range of onsite facilities and within minutes of popular tourist attractions in a charming French colonial atmosphere. 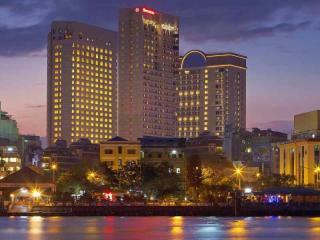 Just minutes from the hotel you'll find Bach Dang Wharf, Saigon Towers, Saigon Skydeck and Vincom Shopping Centres. Located just minutes from the centre of Ho Chi Minh City, Hotel Nikko Saigon offers luxury 5 star accommodation away from the bustle of the CBD yet offering all the convenience. Offering an impressive range of onsite facilities and a wide range of spacious accommodation, the hotel is conveniently located within walking distance of the Saigon Culinary Arts Centre and Cho Quan Church and just minutes from Zen Plaza and Quoc Tu Pagoda. 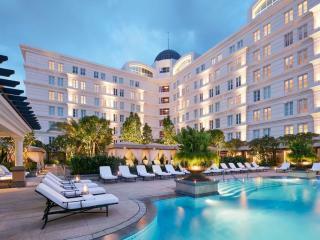 InterContinental Saigon allows guests to stay in style and comfort right in the heart of Ho chi Minh City. 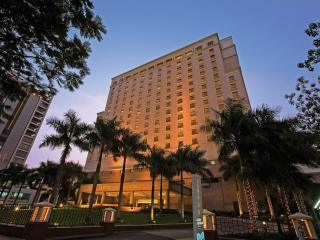 This 5 star hotel features three restaurants, bars, a day spa and an amazing 24 hour health and fitness centre. 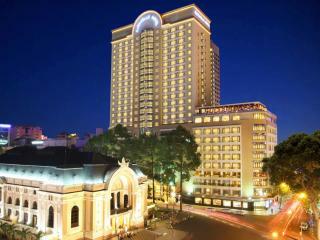 Within a short walk guests will find popular tourist landmarks such as the Saigon Opera House and Notre Dame Cathedral. A fantastic array of dining and shopping activities are also nearby. Located in the heart of Saigon's commercial district, Lotte Legend Hotel Saigon offers 5 star accommodation situated on Saigon's scenic riverside. Combining striking natural beauty with distinctive architecture and modern style, the hotel offers a deluxe range of accommodation and onsite facilities within walking distance of Ton Duc Thang Museum and Saigon Square 2 and just minutes of Bah Dang Wharf and Parkson Plaza. 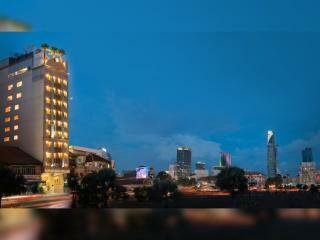 Centrally located to attractions such as the Ben Thanh Market, Zen Plaza and Mariamman Temple, New World Saigon Hotel is the largest hotel in Vietnam. Offering 5 star accommodation in the centre of the city, the hotel features an excellent range of leisure facilities and combines historic architecture with all the modern comforts. Conveniently close to landmarks, museums and attractions, the hotel is just a short drive from the international airport. Located in central District 1 in Ho Chi Minh City, Park Hyatt Saigon offers beautifully-appointed 5 star accommodation surrounded by boutique shopping, parks and restaurants and just a short stroll to a range of popular tourist attractions and landmarks. Offering an impressive range of onsite facilities, the hotel is within walking distance of Reunification Palace, Ben Thanh Market and the Notre Dame Cathedral and just minutes from Le Thanh Ton, Dong Koi and Ton That Thiep Streets. 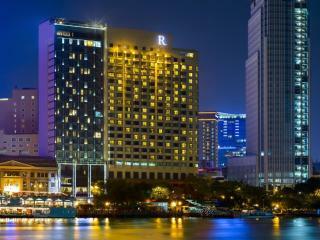 Centrally located in Saigon, Renaissance Riverside Hotel Saigon offers 4.5 star accommodation in the heart of Ho Chi Minh City. Conveniently close to a range of shopping, dining and attractions, the hotel is set in the middle of a popular business district and enjoys a great range of onsite facilities as well as lovely views of the city and Saigon River. Close to museums, galleries and landmarks, the hotel offers easy access to Ton Duc Thang Museum, Bach Dang Wharf and the Saigon Trade Centre. 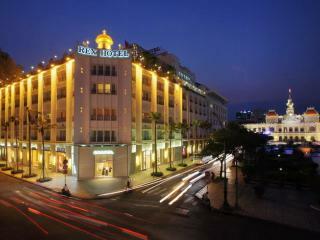 Located in Ho Chi Minh City's CBD, Rex Hotel is an historic landmark dating back to the early 20th century. Offering 5 star accommodation conveniently located close to a range of shopping, entertainment, dining and attractions, this once-French garage now boasts a lovely range of accommodation and fantastic onsite facilities. Within walking distance of Ho Chi Minh City Hall Square, the hotel is also just minutes from Parkson Plaza and the Opera House. 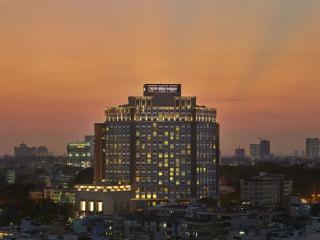 Located in Ho Chi Minh City's central business and entertainment district, Sheraton Saigon Hotel and Towers offers luxury 5 star accommodation with spectacular views of the city. Boasting a vibrant atmosphere, the hotel offers a convenient range of facilities and is just a short stroll from the Opera House and Saigon Trade Centre. There are also a great range of tourist attractions within minutes of the hotel including Ho Chi Minh City Hall and Square and the Vincom Shopping Mall. Conveniently located in the heart of Ho Chi Minh City, Silverland Central Hotel offers stylish accommodation enjoying striking views out over the city and the nearby Ben Thanh Market. Within walking distance of a number of dining, shopping and entertainment options as well as tourist attractions, landmarks and museums, the hotel puts everything at your doorstep including a great range of leisure facilities. Enjoy a wide range of modern, affordable and luxury accommodation with hotels and resorts conveniently located close to attractions, dining and shopping.